We need a new European Commission that is committed to the defense of Europe’s borders.” — Hungarian Prime Minister Viktor Orbán. “A few months ago … there was an election in Hungary. The Hungarian people decided what should happen, and during the election campaign we discussed all of the issues — including CEU, the NGOs, and all of the important political issues. And the people decided on these issues. And now the European Parliament is taking upon itself the task of overruling the decision made by the people of Hungary and forcing the Hungarian government to implement what they are attempting to impose on us in place of the people’s decision.” — Hungarian Prime Minister Viktor Orbán. “Hungary and the Hungarian people have been convicted because we have proven that migration is not needed and that it can be stopped.” — Hungarian Foreign Minister Peter Szijjártó. “Hungary’s decisions are made by the voters in parliamentary elections. What you are claiming is no less than saying that the Hungarian people are not sufficiently capable of being trusted to judge what is in their own interests. You think that you know the needs of the Hungarian people better than the Hungarian people themselves…. This report applies double standards, it is an abuse of power, it oversteps the limits on spheres of competence, and the method of its adoption is a treaty violation.” — Hungarian Prime Minister Viktor Orbán. Voting is over in Hungary, where the prime minister, Viktor Orbán, is seeking to win a third consecutive term. After running a campaign almost exclusively focused on the threat posed by migration, Orbán’s Fidesz party is expected to win a majority in parliament. However, a late push for coordination among the opposition, as well a string of corruption scandals around the government has given Orbán’s foes a glimmer of hope. Hungary’s prime minister, Viktor Orbán, has warned “countries that don’t stop immigration will be lost” in a speech three weeks before he seeks re-election for a third term. Addressing a huge crowd of supporters in Budapest on Thursday, Orbán used the speech to paint the upcoming vote as part of an existential battle for the survival of Hungary and Europe. He sees himself as a saviour of Europe’s Christian nations. Hungarian Prime Minister Viktor Orban has used a visit to Bulgaria to once again lash out at the EU’s migration policies. His words come in the run-up to his country’s April elections. “We think migration is dangerous to public security, to our welfare and to the European Christian culture,” said Orban. The European Union’s top court has dismissed complaints by Slovakia and Hungary about EU migration policy, dealing a blow to the Hungarian prime minister, Viktor Orbán, and his allies in central Europe over the bitterly contested policy of refugee quotas. In an important victory for the EU, judges threw out a challenge against its mandatory relocation scheme, which aims to relocate 120,000 asylum seekers around the bloc. The victory has sharpened tensions between the EU and Hungary’s combative PM, who has made opposition to EU asylum policy a core theme of his “Stop Brussels” campaign. It will also raise tensions with Poland, which lent its support to the failed legal campaign. The prime minister of Hungary, Viktor Orbán, has ramped up his populist rhetoric ahead of April elections to claim that “dark clouds are gathering” and that his country is a last bastion in the fight against the “Islamisation” of Europe. 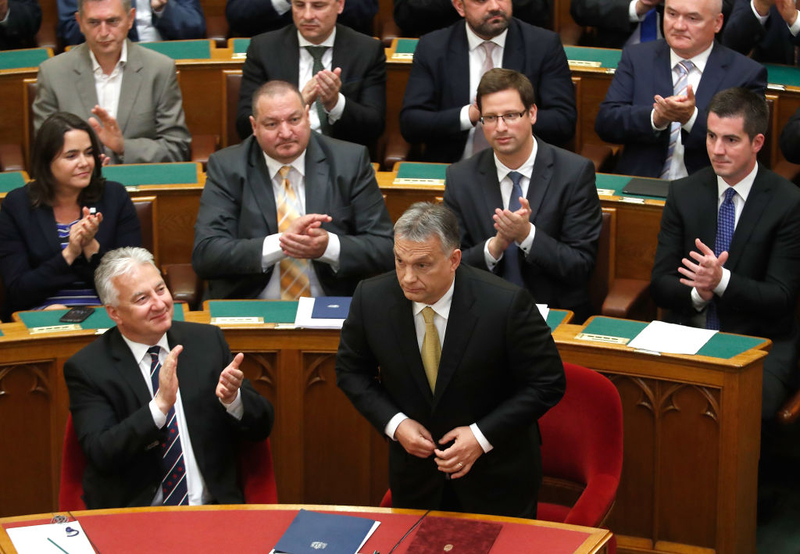 In his annual state of the nation speech, Orbán, who already appears set to win a third consecutive four-year term, made what are now familiar claims about his success in beating back threats to Hungary’s way of life from “Brussels, Berlin and Paris politicians”. “We sent the muzzle back to Brussels and the leash back to the IMF,” he said early in his address on Sunday, praising the strength of the country’s economy.